This kit is assembled “dead bug” style. 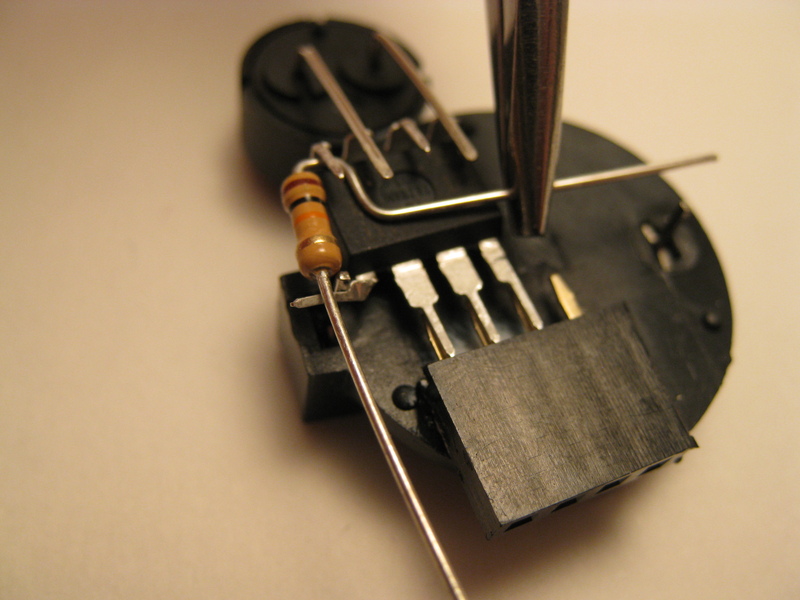 The first step is bending all the pins on the IC into the correct positions. Before handing the IC, ground yourself by touching a metal object like a door handle. Static electricity can damage ICs internally. I recommend reading through the entire instructions once, before following any of the steps, to get an understanding of how everything fits together. This will make assembly much easier. 1. Carefully note the dot on the corner of the IC. This denotes pin 1. 2. Turn the chip over so that pin 1 is the corner furthest from you on the left. 3. 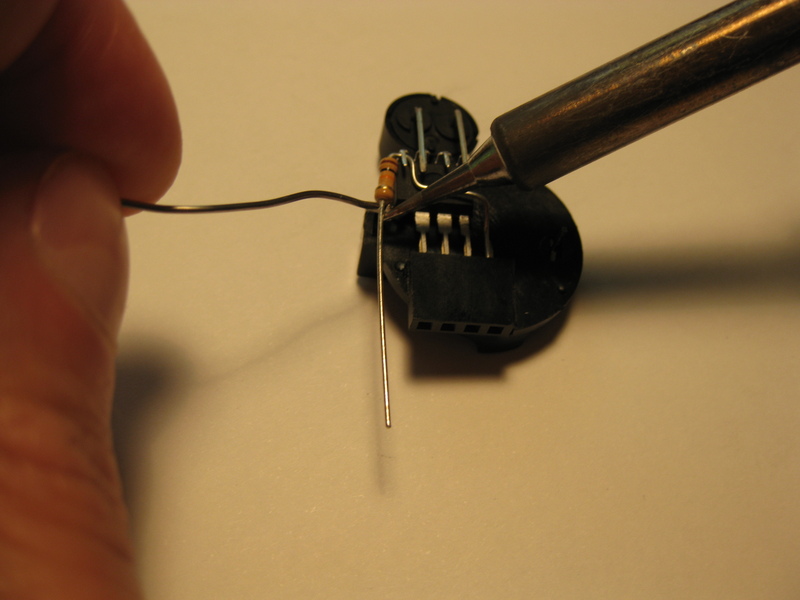 Now, using your needle nosed pliers, bend pins 5 through 8 so they stick out perfectly straight, as in the photo below. When bending these pins, what you want to do is essentially straighten out the bend that the factory puts there, so the entire pin is flat. 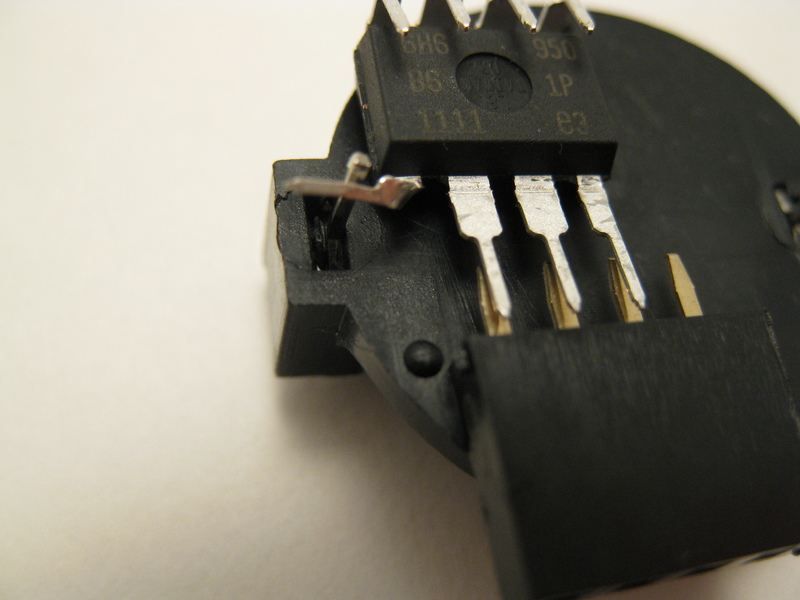 Be very careful when bending pins on the IC. Be gentle, and don’t bend them back and forth repeatedly, or they will likely snap off. 4. Now bend the other 4 pins so that all 8 pins are pointing the same direction. Bend these pins at the point that they narrow, so you are bending only the narrow part of the pin. 5. This next part can be a bit tricky. Take pin 8, and bend it on an angle. With the chip sitting flat on the table, the pin should be at approximately 45 degrees to the table, and from the top, it should be pointing perpendicular to the other pins. 7. Ideally, pin 8 will touch the positive terminal, but be bent slightly lower than the top of the terminal, making a sort of X shape. This will be useful later for resting the lead of a resistor in. If the X is more like an upside-down V instead, the resistor won’t easily rest there. Image 9 shows the X, with the place for the resistor’s lead to rest. As you can see in the photo, the header block is the next thing to get ready. 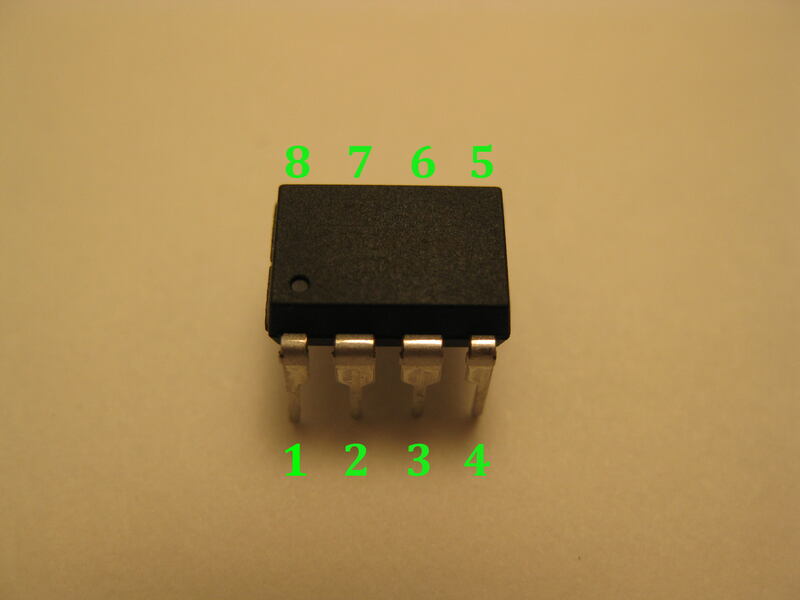 If the pins on the IC were bent just right, the pins on the header block should slide beneath them, sitting very close, but not actually touching. If everything isn’t sitting right, adjust the bends in the pins slightly until it’s correct. Again, be very careful when bending the pins, and try not to bend them back and forth again, or they may snap. Once everything is all lined up, you can glue it to the battery holder. Coat the back of the IC in a thin layer of glue, and hold it in position until the glue sets enough. With the super glue I’ve been using, this takes only a few seconds. 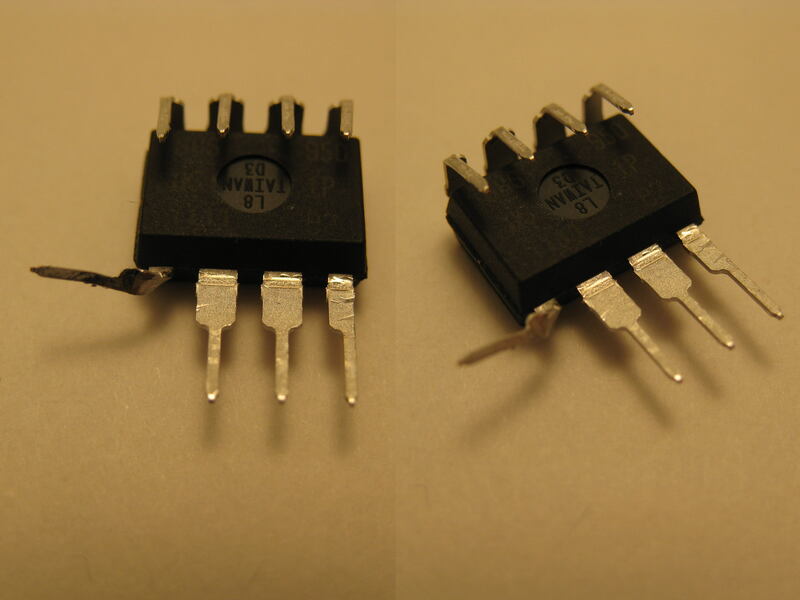 When you glue the IC, be careful to position it carefully. Double check that pin 8 is touching the correct battery terminal, and that the IC is orriented properly. 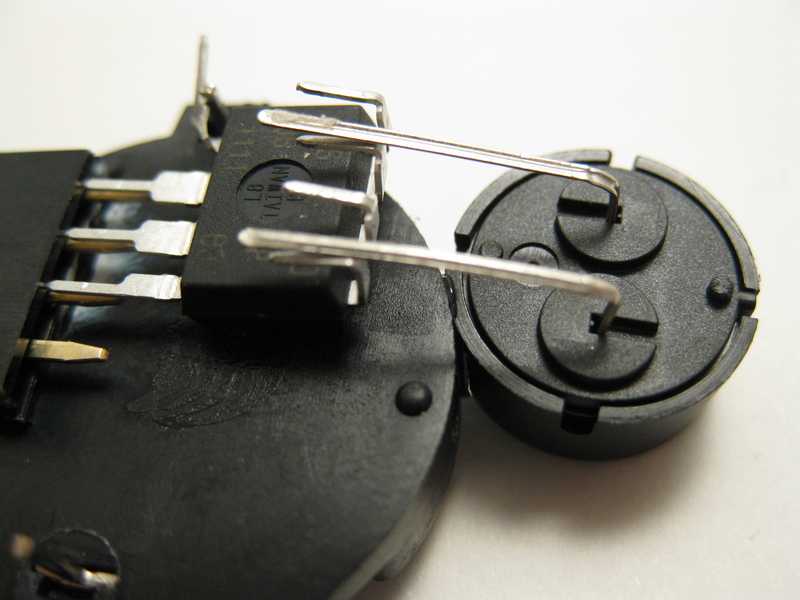 The pins sticking out straight (5-7) should be perpendicular to an imaginary line drawn between the battery terminals.Once the IC is firmly in place, put some glue on the headers and put it into position, sliding its pins under the pins on the IC. 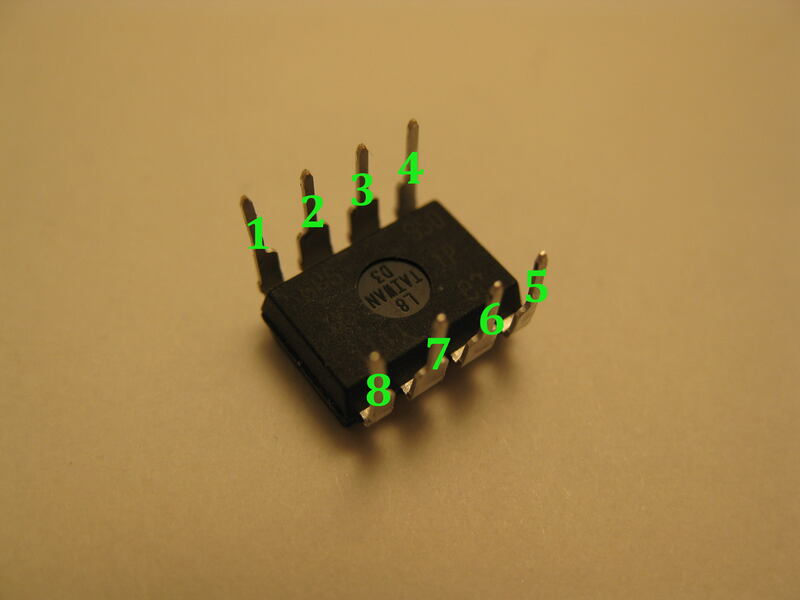 Make sure to leave 1 pin of the header hanging past the IC, as in the photo. 9. 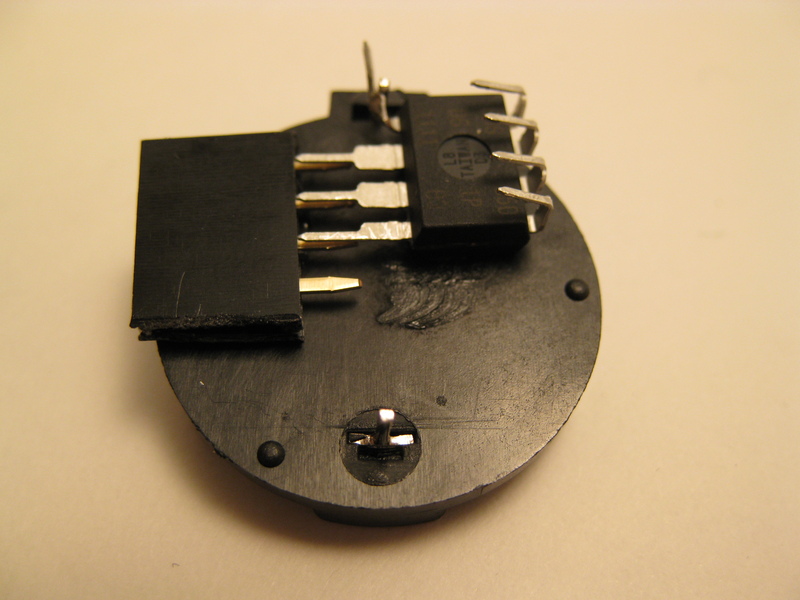 Next up is the piezo buzzer. 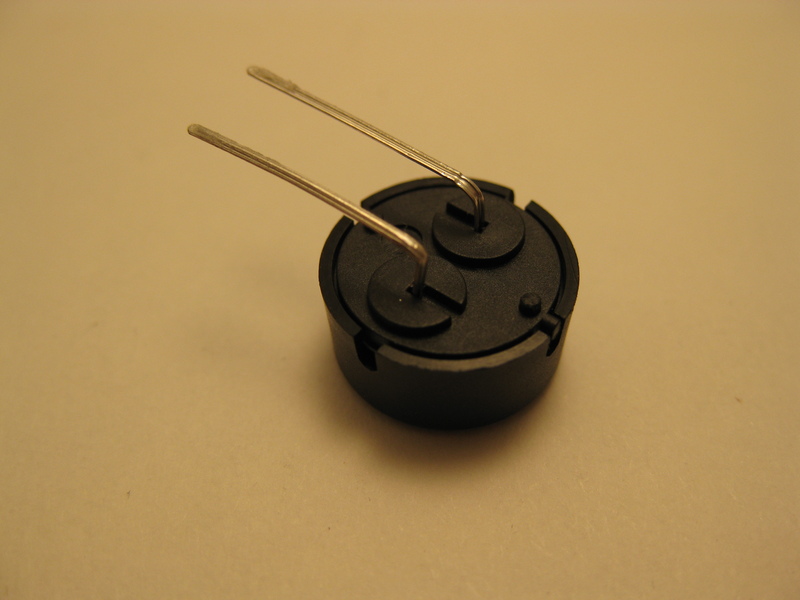 The piezo is unpolarized, so you don’t have to worry about which pin is which. Bend both pins so they make a nearly 90 degree angle. Leave about 2 mm straight before making the bend. Before bending it, see in Image 12 how it is intended to sit. Depending on how your IC pins are bent over, you may need to leave more or less than 2mm of the piezo’s leads before the bend. 10. 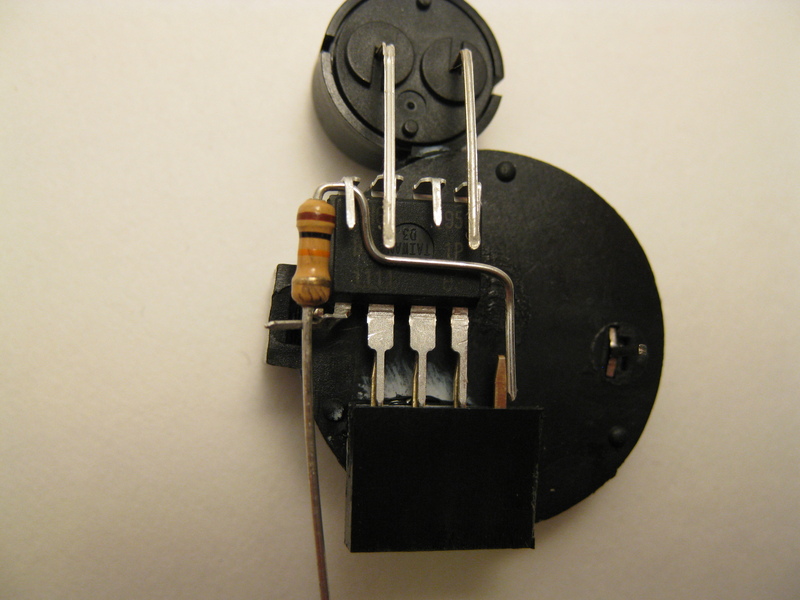 The idea here is that the buzzer will be glued to the side of the battery case, with its two leads touching, or nearly touching, pins 2 and 4. Once you’ve got the angle right, dab a bit of glue onto the edge of the battery case, and hold the buzzer in position until the glue sets enough. If the glue you’re using needs a while to set strong enough to take a bit of abuse, now would be a good time to take a break and let the glue do it’s thing. 11. These next few steps are potentially the hardest part of this kit. Don’t rush it, take your time, and it’ll come out fine. 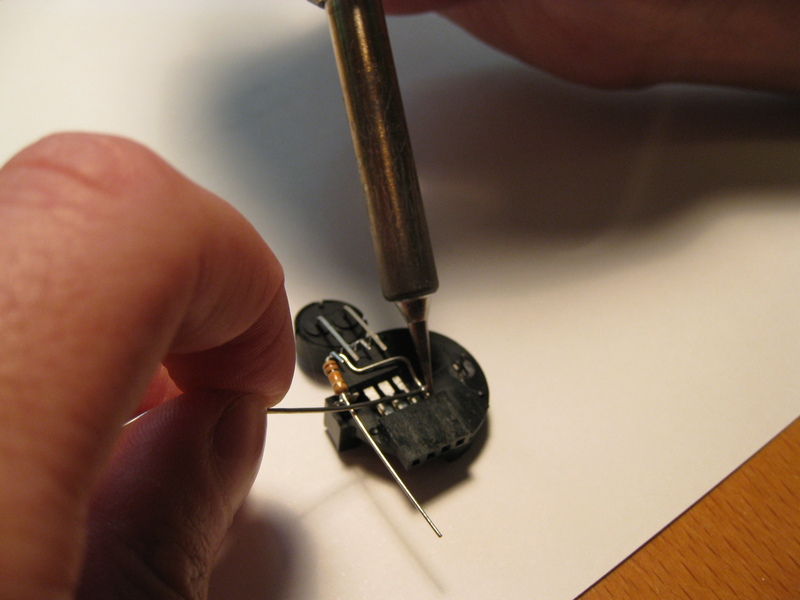 Next up is preparing the first resistor. 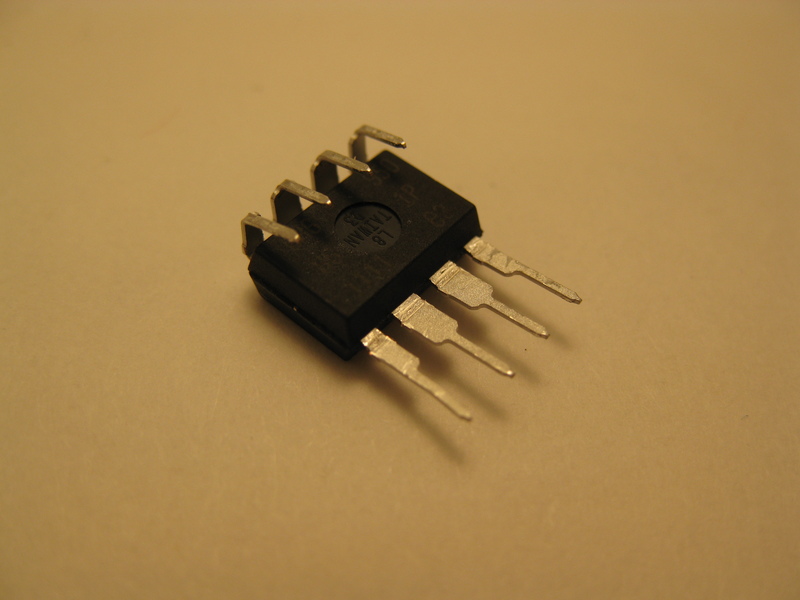 This resistor does double duty of connecting the IC’s reset pin (pin 1) to Vcc (pin 8) through a resistor, and connecting the reset pin to the programming header. 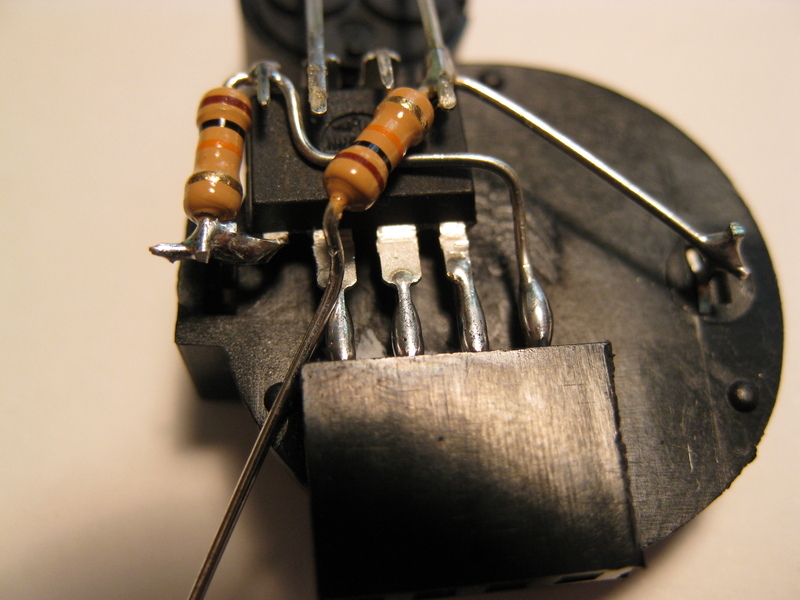 When bending the leads on this resistor, I recommend not holding it against the kit and bending it. 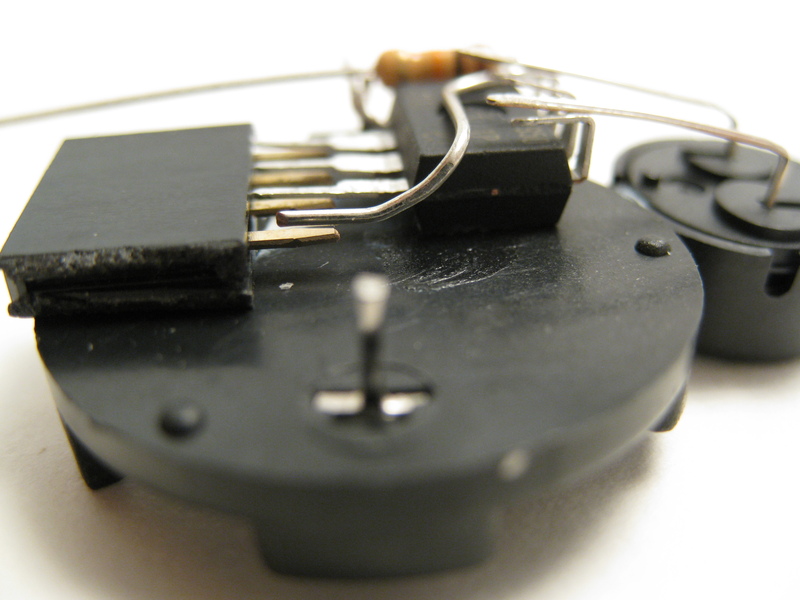 Doing so can easily break some of the glue that was used earlier, particularly the glue holding the buzzer in place. The first step is to put a nearly 180 degree bend in one of the leads. 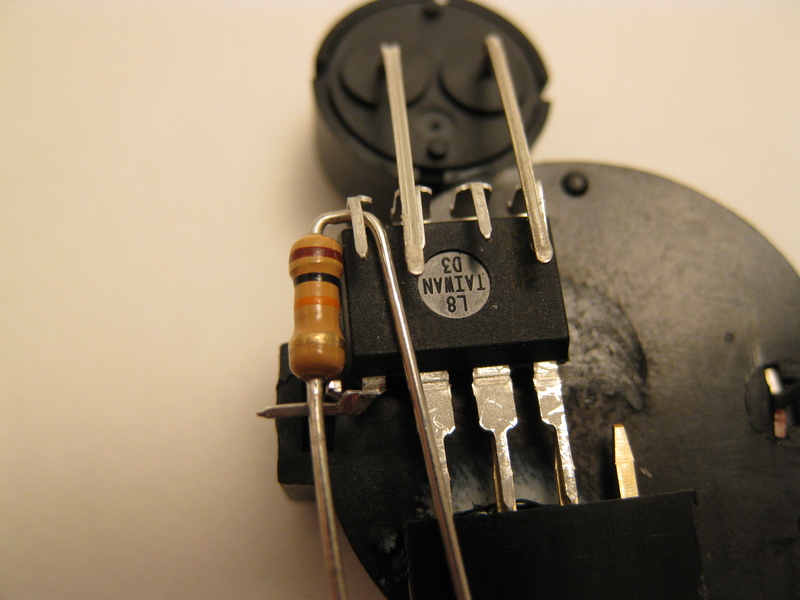 This bend needs to be extremely close to the end of the resistor, as Image 13 shows. 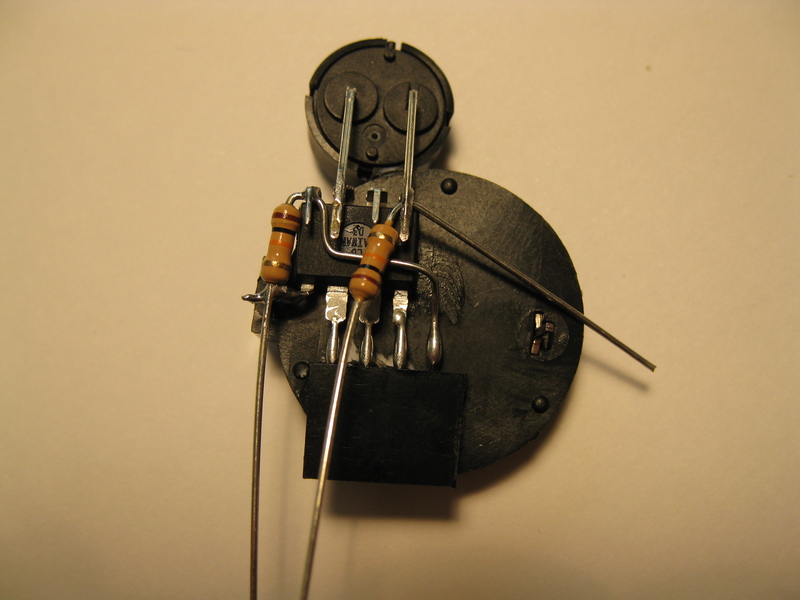 The resistor needs to fit with it’s lead under pin 1, and the other end of the restor in the crook of the X we made earlier, as seen in Image 14. As should be aparent from that photo, if the 180 degree bend is made too far from the end of the resistor, it won’t fit under pin 1. 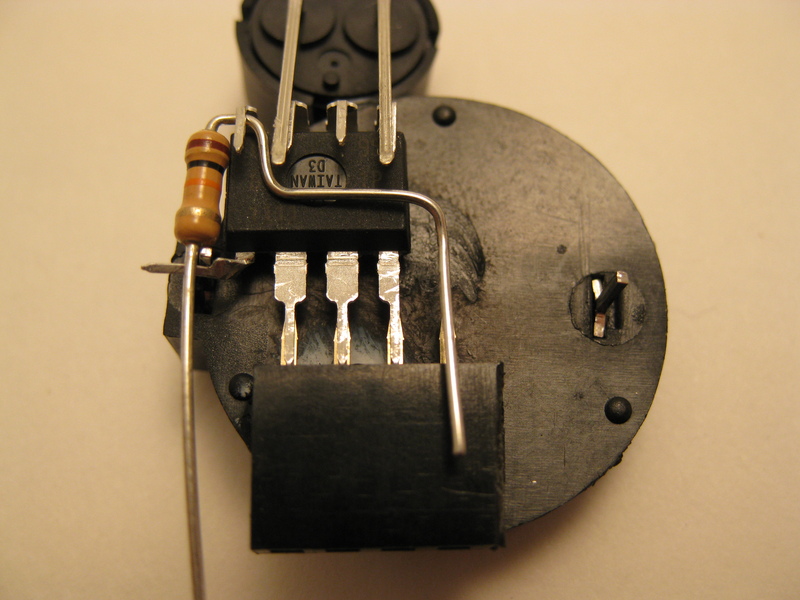 The bend must also be of a large enough radius that the resistor can sit beside the IC, with the bend reaching out under pin 1, and sitting on top of the IC. It should sit just beside the IC, with the top lead going under pin 1. If everything has been lined up nicely, it should sit there on it’s own, without being held. We’re not done with this resistor though. 13. 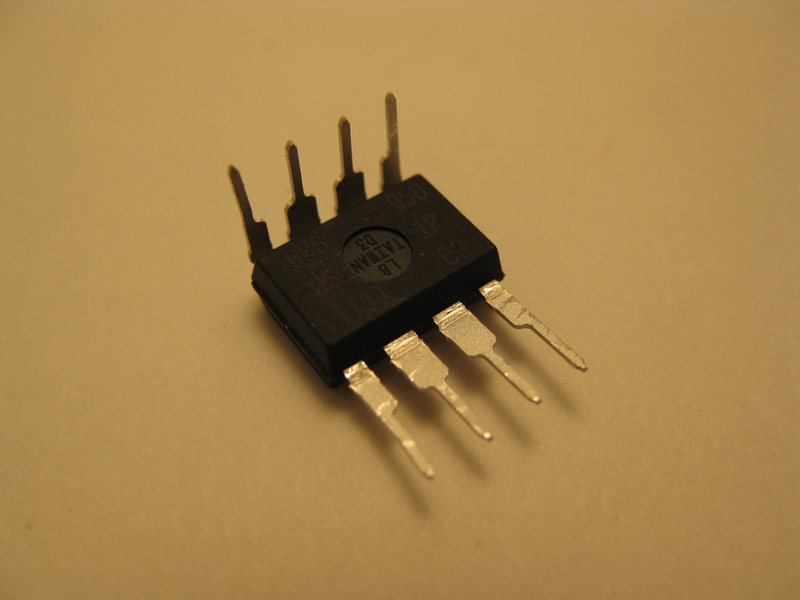 The top lead of this resistor also needs to connect to the rightmost pin of the header block. Put a 90 degree bend in the lead, far enough down that it won’t be too close to pins 5-8, but close enough to the previous bends that it won’t be near pins 1-4. 15. The next bend is a bit tricky. It can be a bit hard to get this one in the right spot, so I like to pick up the resistor with the needle nosed pliers, grabbing it from the point where the bend needs to be made. 18. Now that it’s the right length, bend a little jog in the end so that it nearly, but not quite, touches the pin on the header. It should sit just above the pin. 19. Now it’s time to start soldering. I find it easiest to start with pin 1, soldering it to the resistor. 20. 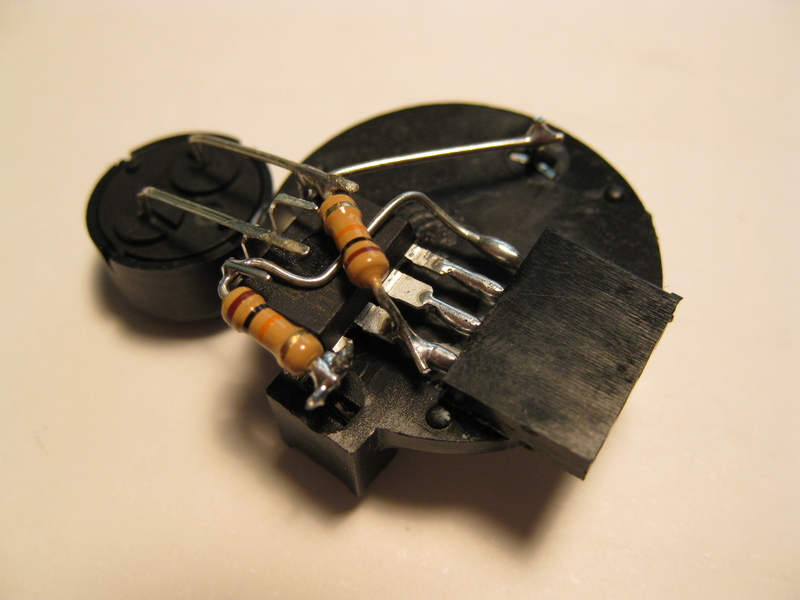 Once this is held in place, soldering the other two ends of the resistor are easier. Make sure that the bottom end of the resistor has a good connection to pin 8 and the positive battery terminal. 21. Be careful when soldering the resistor to the header block, as heating the pin on the header block for too long can melt the plastic. 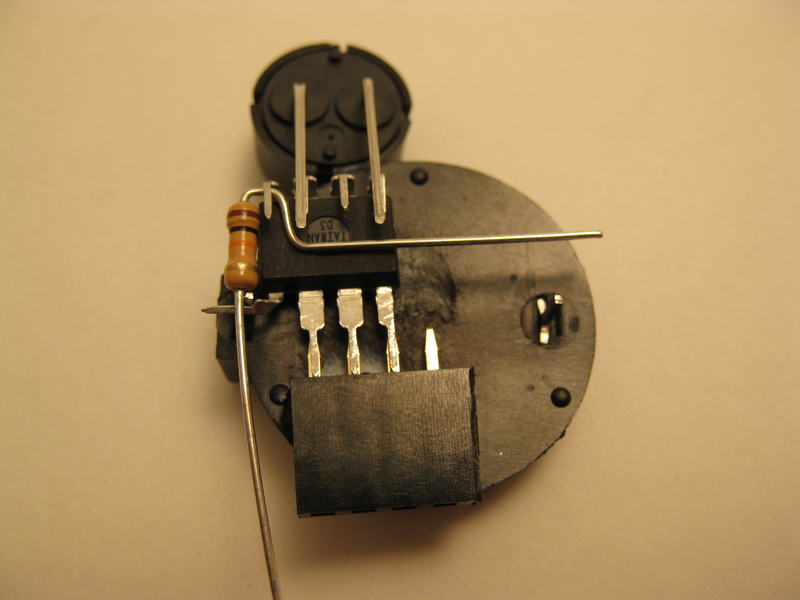 Once the resistor is soldered, snip the other end off with the edge cutters. Solder pins 5 through 7 as well, being careful not to heat the pin on the header block too much, or it may melt the plastic. 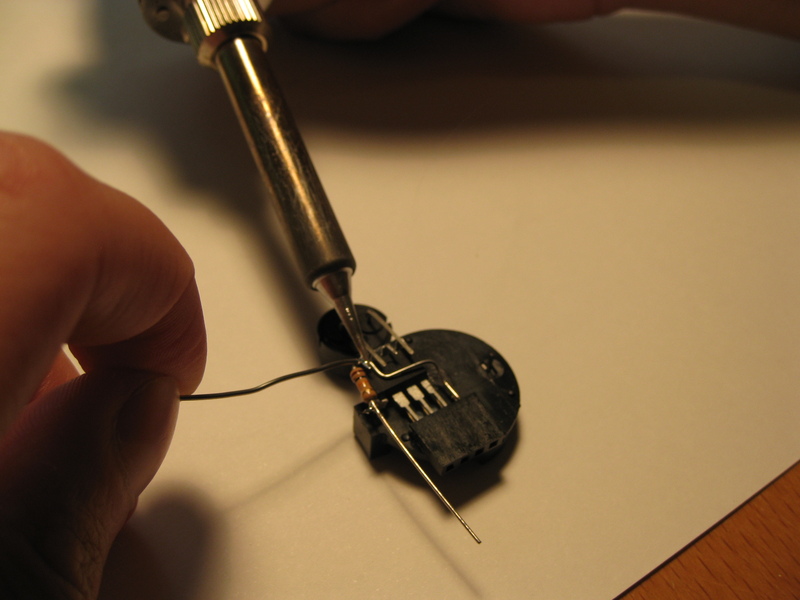 Finish up the soldering for now by soldering the leads of the buzzer to pins 2 and 4. 22. You’re on the home stretch now. 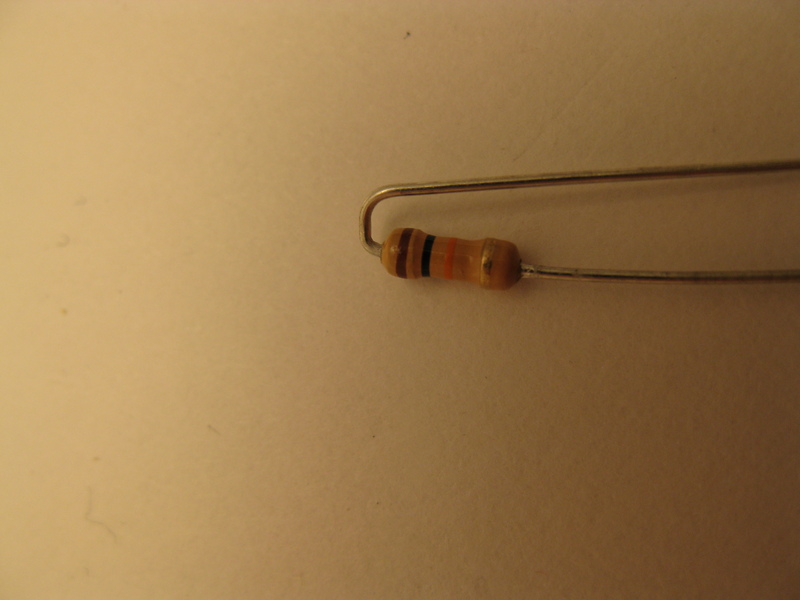 Just the second and final resistor to do. This resistor also serves double duty. 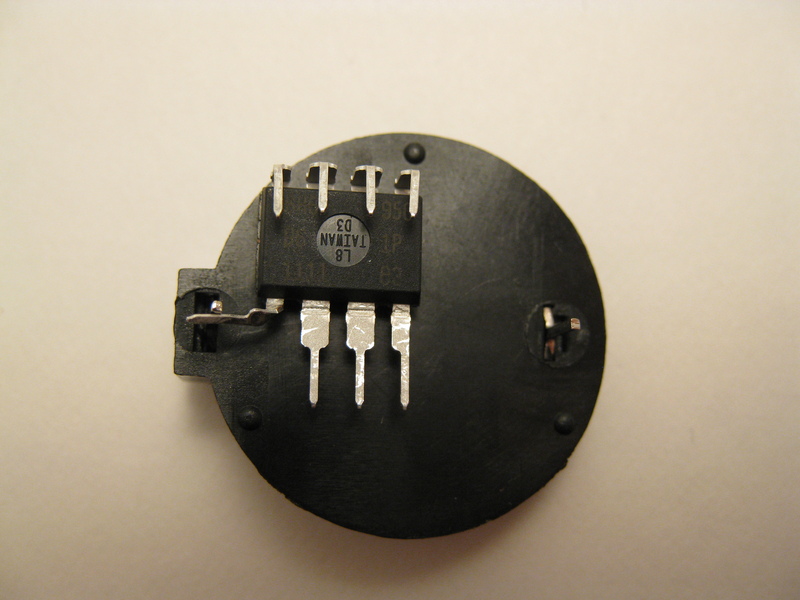 It connects pin 7 to ground, through the resistor, and also connects pin 4, the ground pin, to the negative battery terminal. Put a 90 degree bend in one of it’s leads, a couple millimeters from the resistor. 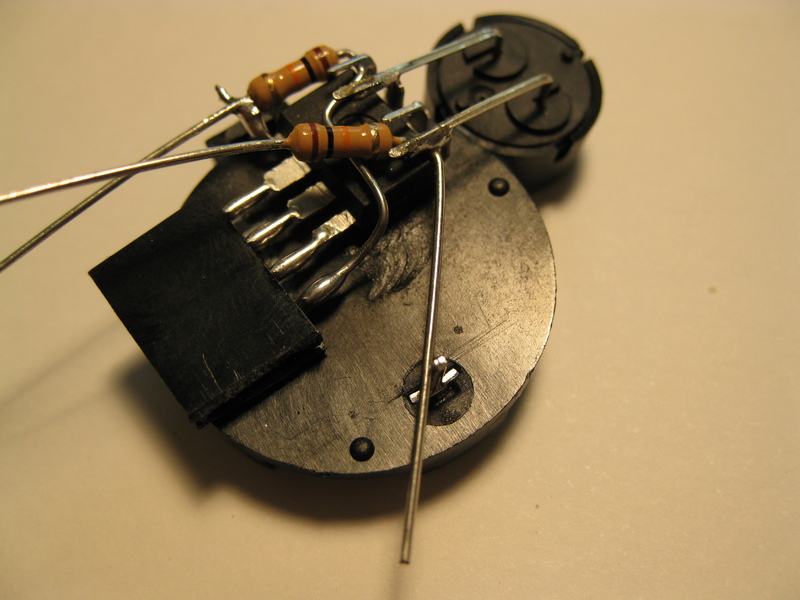 You want it to sit like this photo, with the narrow waist of the resistor sitting over top of the other resistor’s lead, and the lead under pin 4 of the IC. 23. Solder the resistor to pin 4, making sure there is still a good connection with the buzzer. Now, bend the lead so that it’s touching the negative terminal on the battery, and solder them together. Snip the remaining lead off with the edge cutters. 24. 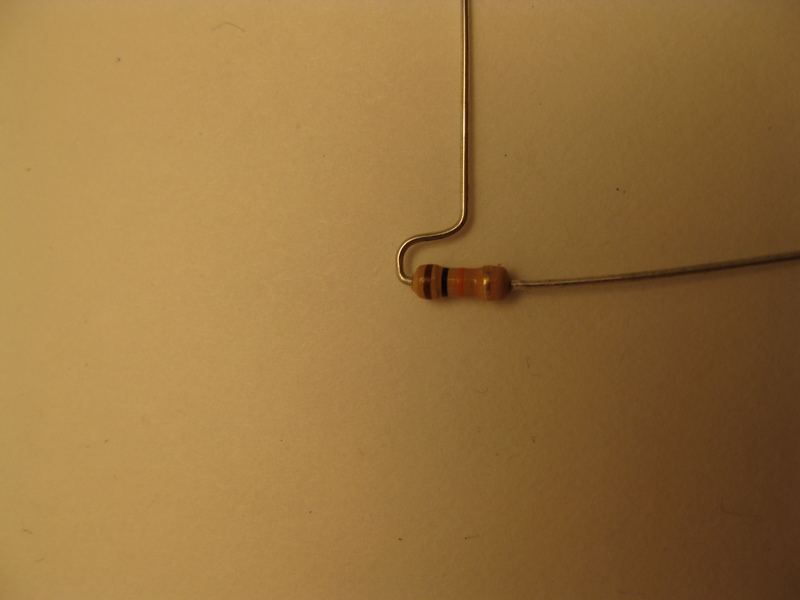 Lastly, bend the other lead of the resistor down until it touches (or nearly touches) pin 7. I tend to just use the end of my needle nosed pliers to basically shove the lead down toward pin 7. Snip the remainder of the resistor lead off once it’s soldered. The last step, which is optional, is to glue the magnet on. Where you put the magnet may depend on where you intend to plant the beeper. A couple good places are on the square end of the battery holder right by the positive terminal, or on top of the header block. Just make sure to use plenty of glue, so the magnet doesn’t get ripped right off.